As part of my second research trip to Los Angeles, on Saturday I attended a hearing at the South Coast Air Quality Management District (SCAQMD). At issue was the Exide Technologies battery recycling facility in Vernon, and the lead and arsenic it is emitting into the air. The decision-makers heard from lawyers on both sides of the case, and then opened the hearing up for testimony by residents and other interested parties. Public participation is a key part of much environmental decision-making, and over time advocates have convinced many decision-making bodies to provide translation services. 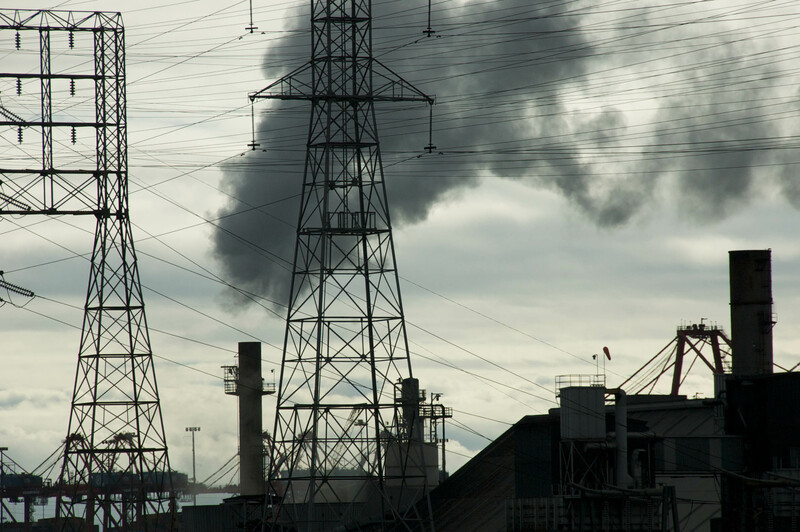 This helps the many Spanish-speaking residents who live near polluting facilities to participate in the environmental decisions that profoundly affect their lives. Being able to participate in environmental descision-making does not necessarily mean that that their voices will actually influence decisions, but it is an important first step. See coverage of the hearing by the Los Angeles Times here, and its broader coverage of the company here. On Wednesday night I got back from a week spent visiting some of the most polluted parts of southern California, and in some cases the country. 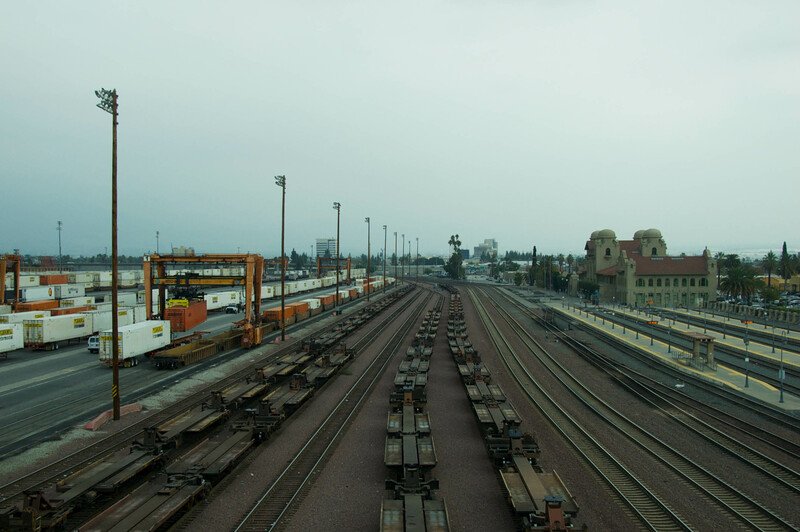 These are communities surrounded by ports, refineries, freeways, train tracks, warehouses and other industrial facilities. They live with air pollution, asthma, cancer, dust, flares, the constant rumbling of machinery and trucks, and bright lights at night. Over the course of the week I heard stories of what it is like to live there. I heard about explosions, fires, police checkpoints, and the not-so-distant history of the Klu Klux Klan. But I also heard stories of improvements made, lawsuits won and protections put in place. My dissertation research covers the growth and changing nature of environmental justice advocacy in California over the past three decades. 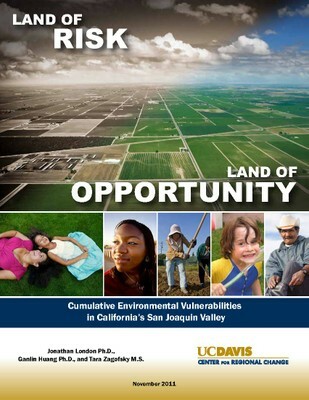 Although I’ve been working loosely in this field for much of the past 14 years, my prior work has focused on the San Joaquin Valley and the international arena. And as a dedicated northern Californian, I find I have little knowledge of the southern half of my home state. So, this trip was an important opportunity to expand my understanding of environmental justice advocacy, and to connect across the gentle rivalry that sometimes divides north from south. I’ve included photos and a description of my trip here in the hopes that through my eyes you too might better understand my state and the problems we face. Day 1: Instead of driving south over the I-5, I went up and over the mountains that divide the Central Valley from Los Angeles through Cajon Pass. 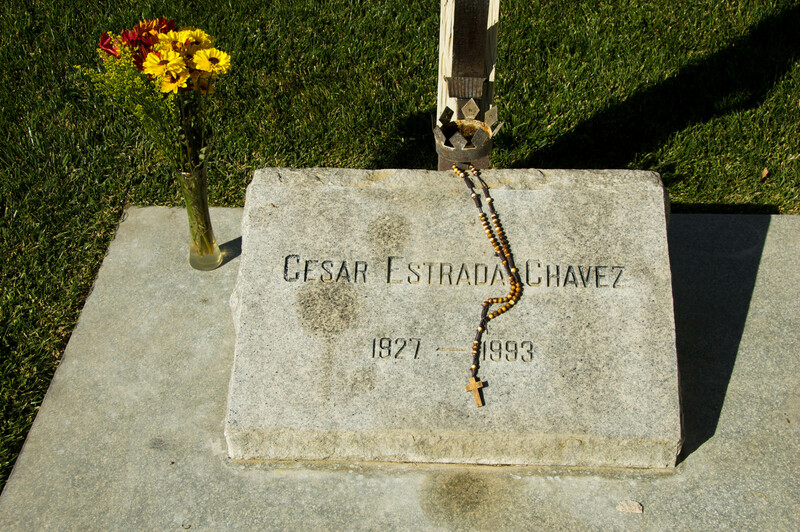 I wanted to visit the César Chávez National Monument in Keene, which President Obama dedicated just last year. 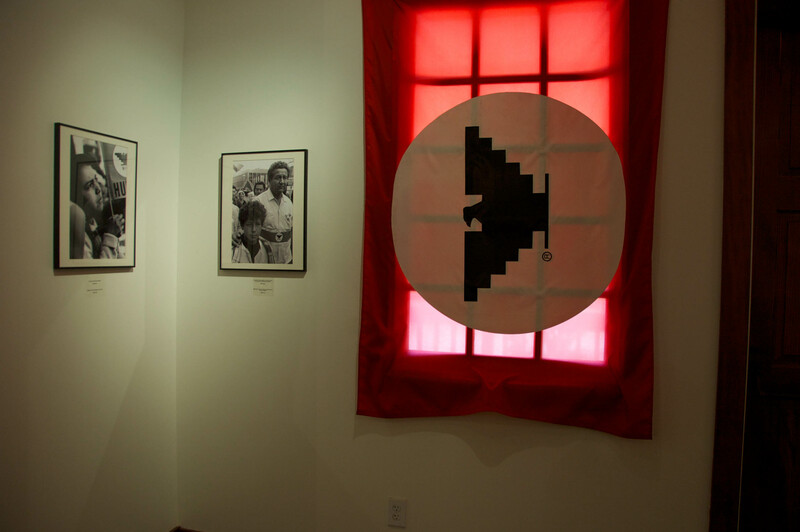 Environmental justice advocates in the San Joaquin Valley have rich ties to the United Farmworkers of America, and César Chávez continues to be a potent political symbol there. The national monument houses his grave, a garden, and a visitor’s center that was showing a photo exhibit of the 1965 Delano grape strike the day I visited. National monuments are administered by the National Park Service. Because I associate the park service with national forests and camping trips, it was jarring to see their familiar signage next to images of César Chávez, farmworkers, and artifacts from the picket line. I’m pleased to see César Chávez and the farmworkers’ movement get this level of attention and legitimacy, but also uneasy to see a memorializing process that makes it easy to think the problems they worked on are things of the past. The drive through the rest of the mountains was beautiful. The Santa Ana winds had blown the air pollution away so I had an uncommon view of the stunning desert vistas around me. I didn’t see them again for the rest of the trip. I ended the day happily in Riverside at a 35th Anniversary Gala Event for the Center for Community Action and Environmental Justice (CCAEJ). CCAEJ got its start through a fight against the Stringfellow Acid Pits above Glen Avon. The site contaminated local groundwater, and on several occasions released liquid hazardous waste into a canyon that carried it into the streets of Glen Avon. 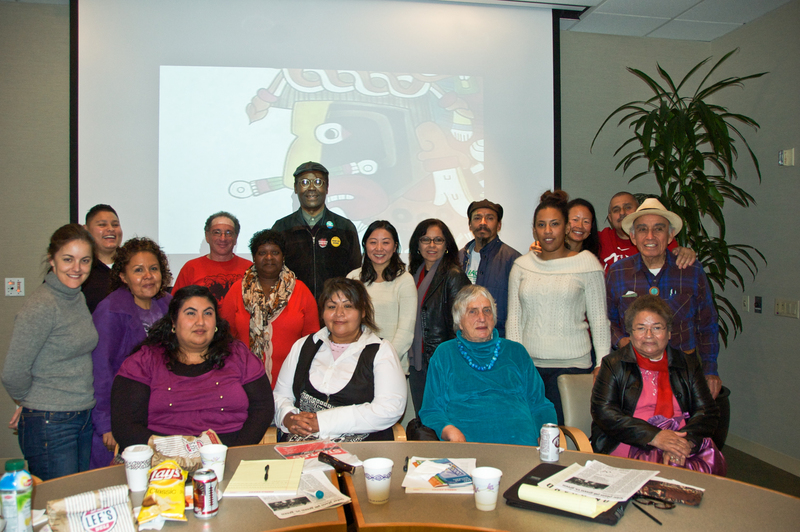 Activism around the site led to the creation of the California State Superfund Program and to the birth of CCAEJ. It is still being cleaned up. Day 2: On Friday I woke up to soak in the beauty of a nearby desert rock formation visible from my motel. 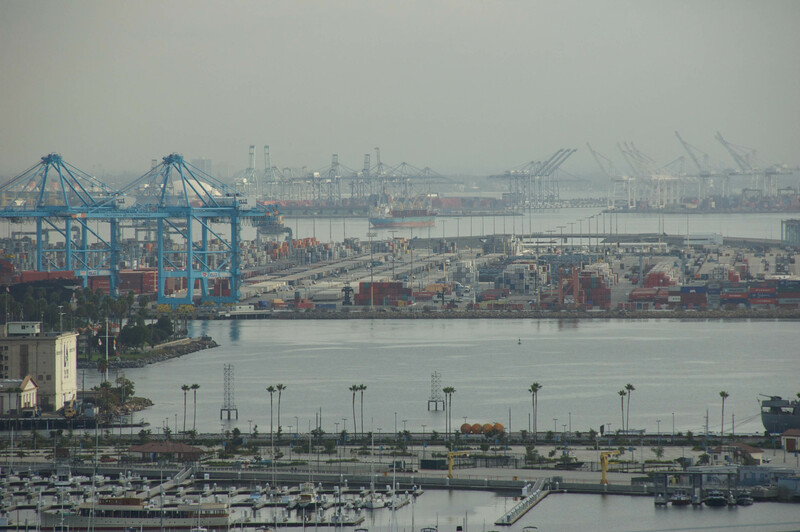 Then I drove to the Los Angeles Port to attend the Harbor Community Benefit Foundation‘s public meeting in San Pedro. 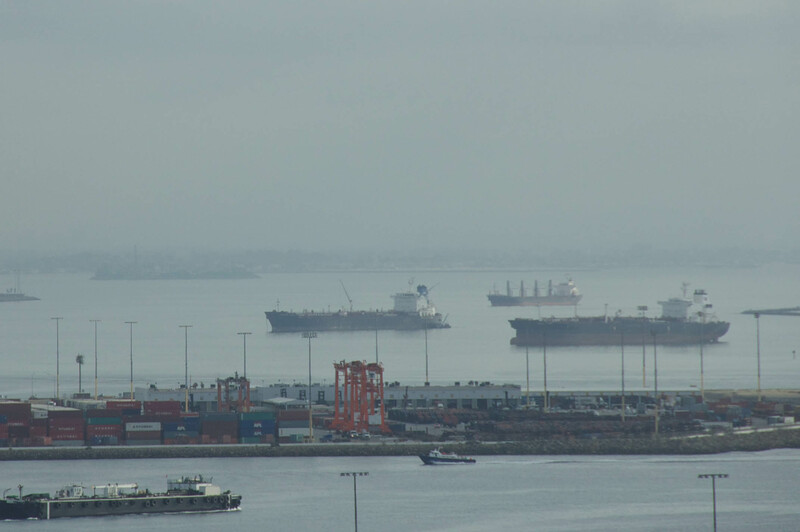 The LA Port is the largest industrial port in the country, and the diesel exhaust from the ships, equipment and trucks that operate there are the largest source of air pollution in the region. 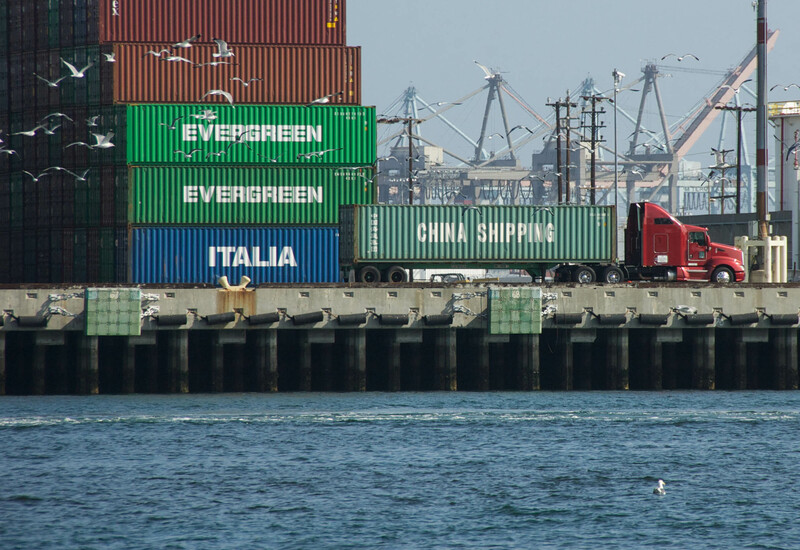 The Foundation was funded by the port after years of activism by local residents and a lawsuit over the negative impacts of the port on the surrounding communities. The day I visited the board was discussing the $506,000 worth of grants they were giving to support local community initiatives. 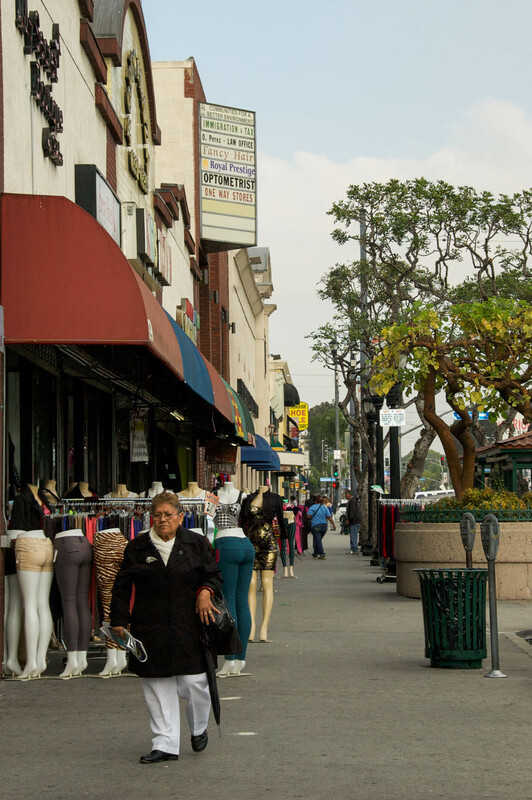 After leaving the port I drove north to Pacoima, where I had a great time interviewing Veronica Padilla and Yvette Lopez from Pacoima Beautiful. They’ve offered to drive me around Pacoima to see their work in person, so I’m looking forward to seeing them again on my next visit! Day 3: Saturday was a welcome day of rest. I organized my notes and audio files, scheduled more interviews, and hung out with my cousin at his office in Glendale (where I slept for the majority of the trip). I had it on my list to clean out my car too, but didn’t quite get to it. 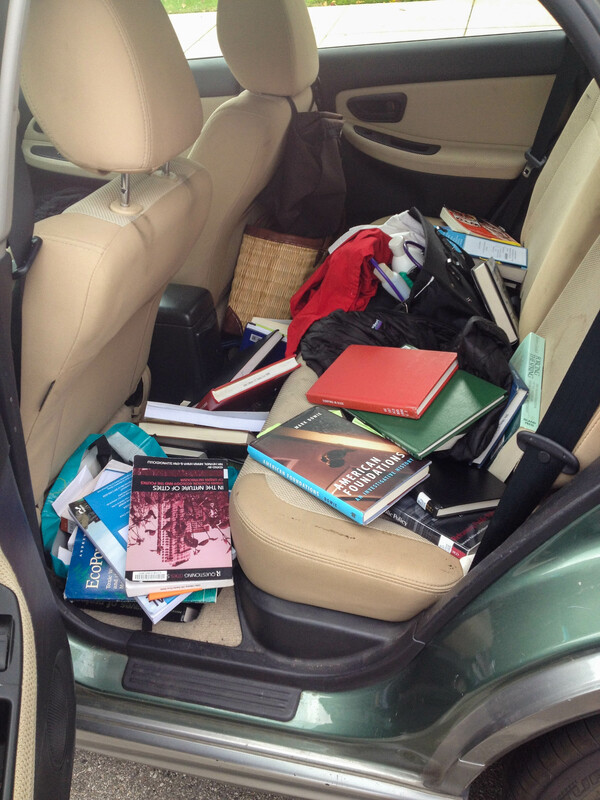 You know you’re a Ph.D. student when you open the car door and books fall out! Day 4: On Sunday I headed back to the area around the Los Angeles Port to interview Jesse Marquez from Coalition for a Safe Environment. Jesse grew up in Wilmington and works to protect his community from the pollution released by its neighboring ports, refineries and other industrial operations. While he printed out reports and campaign materials for me, I poked around his office. There were water samples and soot in jars, maps of the area with callouts pointing to the various projects of industrial expansion, and lots of books. I always find it instructive to peruse people’s bookshelves, and Jesse’s were no exception. 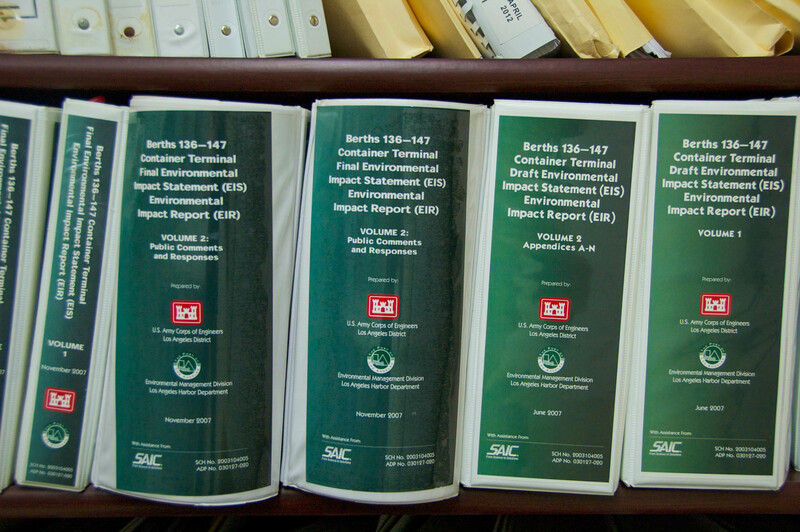 The vast quantities of highly technical environmental impact reports spoke volumes about the maze of government regulations and science that he navigates in his day-to-day work. After leaving Wilmington, I headed to Maywood to sit in on a meeting between residents and their lawyers at the local Denny’s. 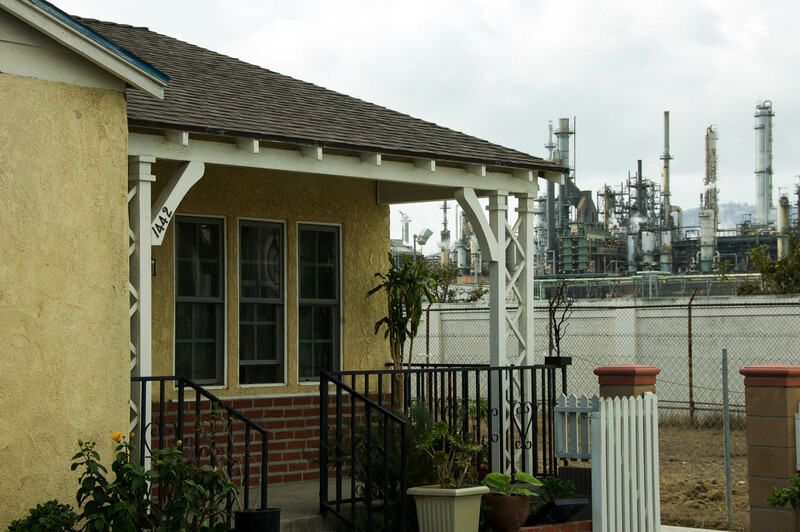 Maywood residents have been engaged in a long battle against a polluting battery recycling plant run by Exide Technologies. The plant has been repeatedly cited for releasing lead and arsenic into the air above legal limits. See coverage by the Los Angeles Times here. Day 5: On Monday I made my first trip to Huntington Park and strolled through the downtown, which was bustling with activity. I met with Strela Cervas from the California Environmental Justice Alliance, a coalition of six California environmental justice groups. We discussed the challenges and opportunities of scaling up local battles into statewide policy work in Sacramento. 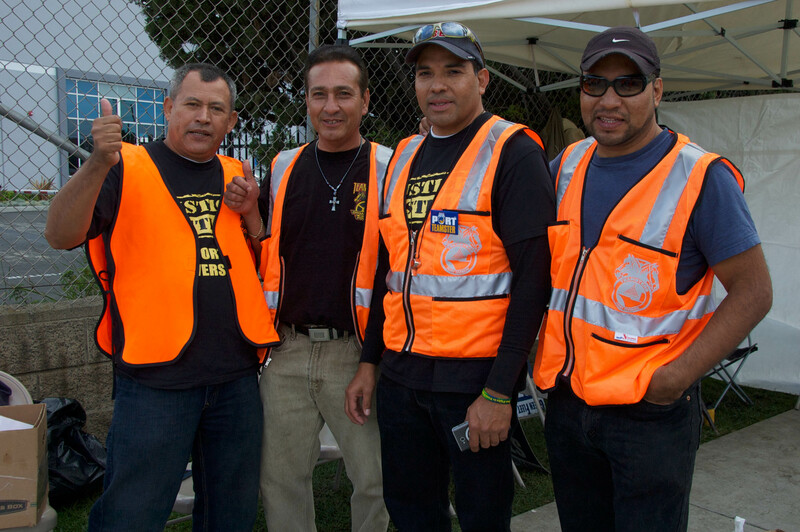 I heard more about their campaign to pass a Green Zones initiative and their support of AB 1330, which would increase enforcement of environmental law in communities overburdened with pollution, and also channel more resources to them. I also learned more about about their “Solar for All” campaign to provide clean energy and jobs in low-income communities through investment in rooftop solar energy production. 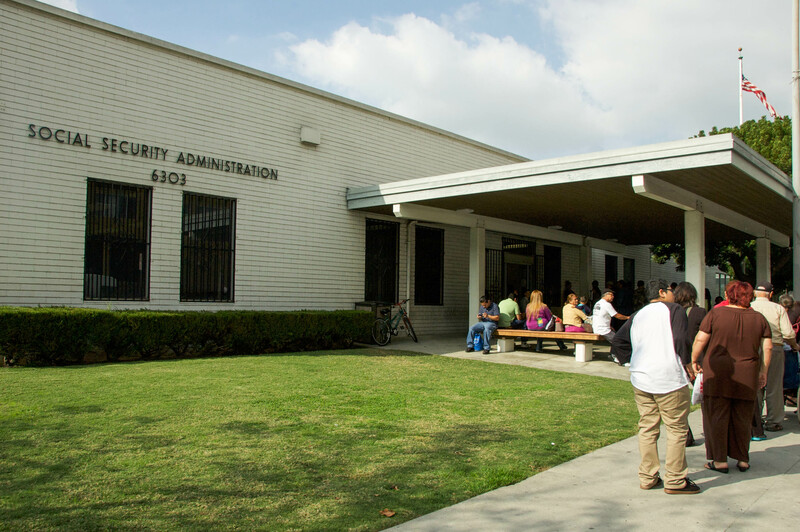 The need for environmental clean up as well as jobs in the communities in which environmental justice advocates work was poignantly underscored when I passed by long lines of people outside the Social Security Administration building on my walk back to the car. 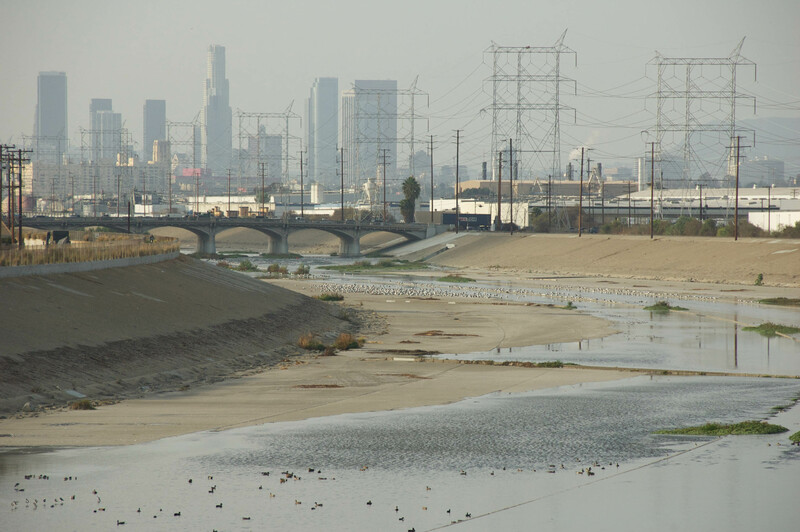 I had a bit of free time before my next meeting, so I drove by the Los Angeles River to take a few photos. It looks more like an industrial flood channel than a river, but I found it strangely attractive nonetheless and enjoyed taking photos of it. 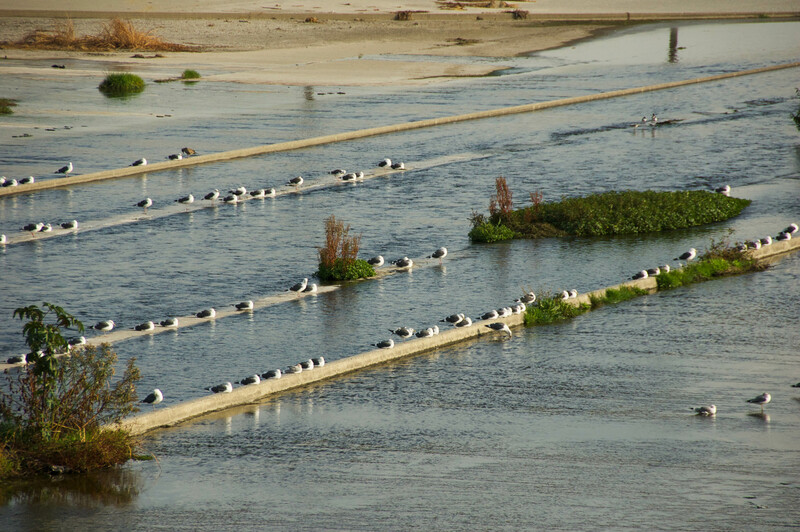 Check out long-term plans to revitalize an 11-mile stretch of the river here. My next interview was with Felipe Aguirre from the Comité Pro Uno in Maywood. Over the din of the trucks passing outside, we spoke about his many years of activism, his role on the Maywood city council, and the air pollution and contaminated drinking water faced by Maywood residents. Felipe told me that he first got involved in environmental justice advocacy when he found out that pollution where he lived was so bad that an administrator at a local school made a habit of referring the kindergarteners from his neighborhood to doctors who screened them for lead poisoning. Visited the Los Angeles Port and learned about ongoing advocacy there from Andrea Hricko and Jesse Marquez. 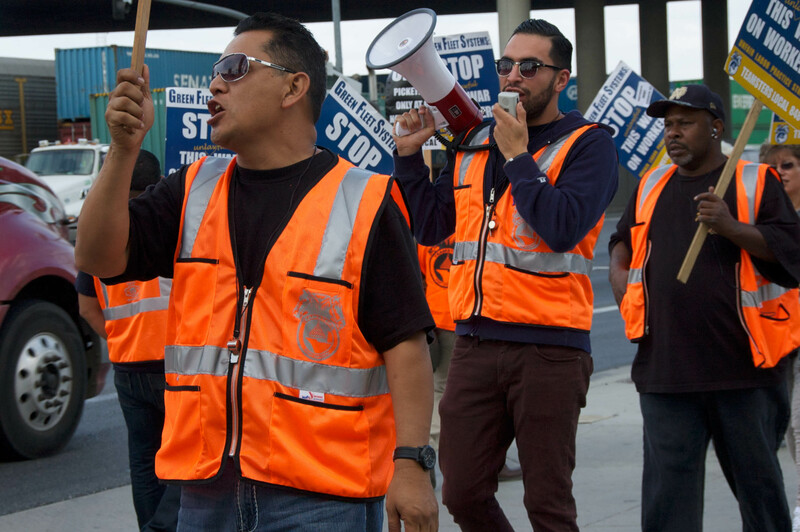 Stopped by a picket line to support a truckers’ strike at Green Fleet Systems. Learned about the 710 corridor and the Southern California International Gateway railyard from Angelo Logan and Mark Lopez. Had lunch at the offices of East Yard Communities for Environmental Justice in Commerce. 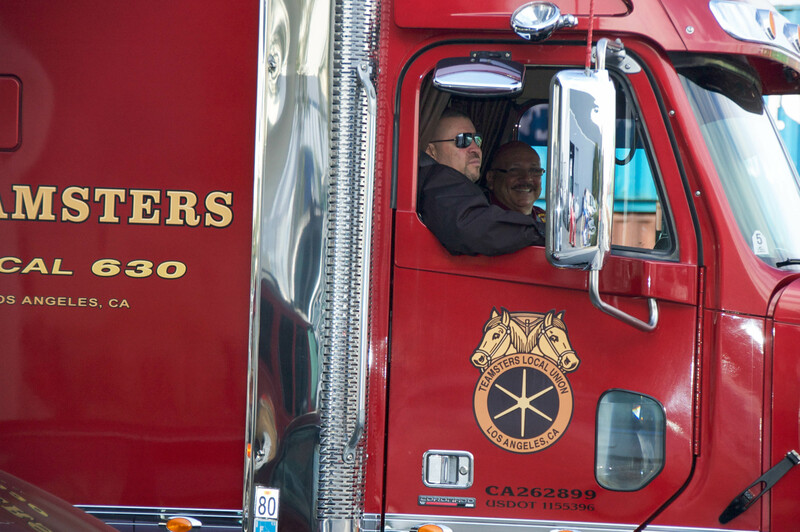 Drove by the warehouses and railyards in Loma Linda and West San Bernadino where Penny Newman explained the impact on local residents of the heavy truck traffic servicing the warehouses. Wrapped up the day with a visit to the office of the Center for Community Action and Environmental Justice in Jurupa Valley. Over the course of the day we used the buddy system to make sure nobody got left behind when we got back on the bus after each stop. My buddy for the day was Juan Parra of Texas Environmental Justice Advocacy Services. We discovered we had a few friends in common, and I enjoyed hearing about the early days of environmental justice advocacy in Texas and the Southwest from him. We also spent part of the drive looking at the Google Map on my smart phone. We used the satellite view to zoom in on the port of Houston and the neighborhood of Manchester where some of his group lives. Juan pointed out a house that we could see was surrounded on three sides by oil tanks and other industrial facilities. The irony of spending the day driving and using electronics to learn more about environmental justice problems that result in part from pollution due to driving and electronics manufacturing was not lost on me. But although we’re all implicated in the planet’s environmental crisis, some of us are less implicated than others. Low-income communities of color usually contribute less to the problem while suffering its impacts more. And like all advocates, we do the best we can with the tools at hand while working towards something better. Day 7: On Wednesday I joined the group from Houston again as they met with an array of local environmental justice advocates and scholars. After our morning meetings concluded, we went on one final “tour.” Alicia Rivera from Communities for a Better Environment drove us through Wilmington, mostly to parts of the town I had not seen before. At one of our stops Francisco Vargas saw us and came out of his home to talk with us. He lives next to the Warren E & P urban oil-drilling site we were looking at. Francisco described how the drilling shakes the earth and has cracked his home’s windows and foundation. He told us that in response to his requests for financial help fixing the damage the company offered him vouchers to get his car washed instead. In spite of his hardships, Francisco shared a few laughs with us before we went on our way. See page 6 of this report for background information on the drilling site. The immensity of the powers arrayed against communities trying to protect themselves from the pollution I saw in LA and the Inland Empire was staggering. That’s why it was so inspiring to learn about the issues alongside the group of advocates from Houston, who are anticipating port expansion projects of their own. 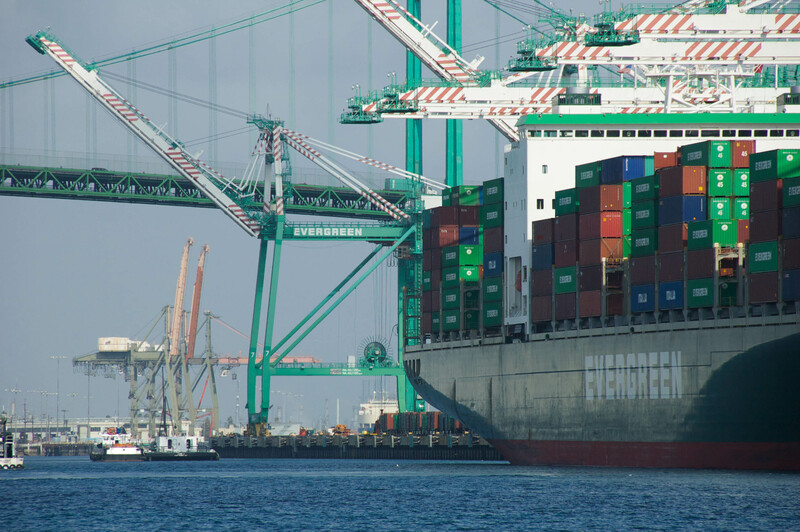 They were here to get a sense of what port expansion can mean, trade ideas, and learn from what California advocates have been able to accomplish. Although I’ve lived in California since I was five, the fact that I was born in Houston made me feel a special kinship with this group. 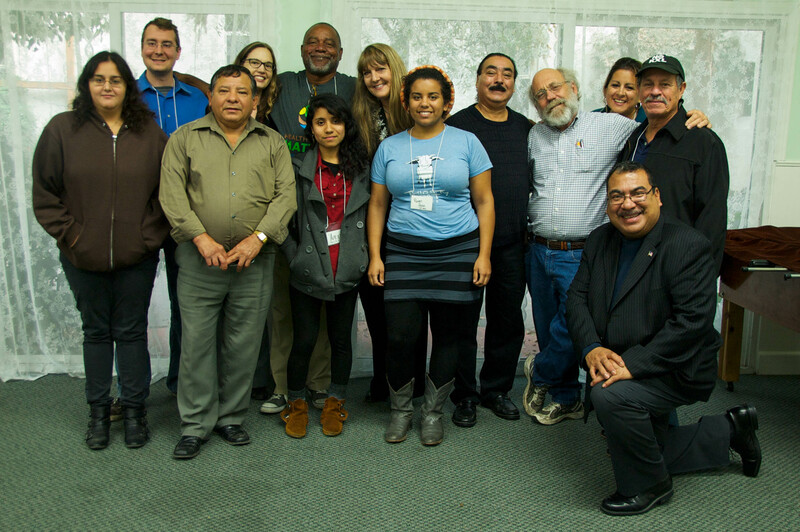 I’m grateful to them for sharing their learning experience with me, and to the Los Angeles environmental justice community for their hospitality and warm welcome. Another old post rescued from my “drafts” folder that stands the test of time. My sister and her family used to live in Amish country in Western Pennsylvania. When I visited I was impressed by the prosperous looking farms and the teams of horses out plowing the fields. On one visit, my brother-in-law pointed out a nice home as we drove by it. He told me the original house had recently burned down, tragically killing several of the family’s children in the fire. My brother-in-law drove that road regularly and watched as the Amish community came together to rebuild the house – finishing it within a matter of weeks. I’ve often thought it would be nice to feel the strong sense of community support that seems to be a part of some religions. But I turned down my own opportunity to join a church when I was a teenager, and am not likely to change my mind now. In my own small, secular ways I try to create other kinds of support systems. They’re not romantic, and often involve making dates to do things with others that I might not do alone. I definitely wouldn’t have spent last Friday afternoon working on the paper for my upcoming qualifying exam, or going to the gym after that, without having a standing date with my writing buddy and another with my gym buddy! Every now and then I also miss the sense of shared purpose that can come from having a job that actually involves people all working on the same project. Academics are mostly doing their own thing, and PhD students are certainly not allowed to co-author their dissertations. Grading get-togethers – for moral support! Soup exchanges – everyone makes a soup at home, divvies it up into containers, and gets together to trade soups so we can stock our freezers with a variety of yummy homemade soups! I try to do this each winter. Friday lunch dates at the college cafeteria – thanks Bernie! Project buddies – I finished my master’s thesis with the help of weekly phone meetings with two other friends working on their own theses, and did the early stages of work for my qualifying exam supported by regular coffee meetings with another fellow student (thanks Brandi!). I both cases we didn’t read each other’s work or talk about the content of our projects, but used the time to set goals, troubleshoot, and get moral support. Future projects partner – all of the ideas above can be done with people who have a wide variety of research interests. In addition, I have one friend whose research interests are very closely aligned with my own, and we have a shared google doc with a ever-expanding wish-list of future research and writing projects to do together. Now, it may be a long time before we get to any of them. I’m diving into my own intensive dissertation research, and my friend is wrapping up research for a post-doc at the same time that she begins a new teaching job. Still, having this running list gives me a place to cultivate the pleasure of dreaming up new projects; provides a sense of myself as a career academic who will get to work on a wide variety of projects over time, even though my dissertation currently seems interminable; and helps me trust that the future that will allow more collaborative work than my current status as a Ph.D. candidate. I’ve heard of others who get together to do their house-cleaning in groups, taking turns with whose house they focus on, but I’ve never tried it. I also keep thinking it would be fun to do a monthly “cook for the freezer” day with a friend. You know what they say, many hands make light work! Or, at least, work that is more fun. without noticing it, live along some distant day into the answer.